Another Christine Keeping-Cool Concoction with a funny name. Espresso-Iced Cocoaccino. Is it original? Is it unique? Prolly not. But it is very tasty. 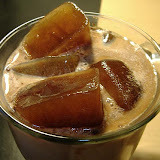 After my success with the tea-sicles, I decided to try espresso ice cubes. I made a double shot of espresso, added a squirt of almond flavoring, let it cool a bit, and poured it into an ice cube tray. Some hours later, espresso cubes! Not sweet or tasty or suckable, I'm afraid, unless you're also the kind of person who chews on coffee beans. But very good in a cup of chocolate milk. I actually had no chocolate milk. I used regular milk and some Nestle's Quick - and some water to thin it down a bit since I seem to be developing lactose intolerance. Add espresso ice cubes and stir. Voila! 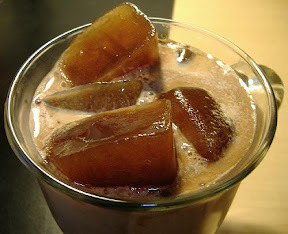 A truly delish not-really-coffee icey drink. I had this virgin-style early in the day, and then another later with a splash of Amaretto and Kahlua. The perfect hot-summer-night toddy. A note about ice cubes - it's probably best to make only as much as you want to use, and use them right away. Leaving them in the fridgey air can make them taste a little ... off. They're hygroscopic. That means they absorb. There's a not-too-technical explanation of the phenomenon here, as well as an explanation about coffee beans and the fridge (same principal). Mmmmmm looks good! Especially on a hot day like today.